We had previously heard that the US version of Motorola's shockingly inexpensive Moto G would be headed to the United States in January, a couple of months after some international markets. It looks like Motorola couldn't wait until next year and has started selling the phone on its website. You can order the US version of the GSM phone now, and it's set to ship on December 2nd. The phone is being offered in 8GB and 16GB versions, with the low price of $179 and $199, respectively. That's the off contract price, mind you, making the Moto G easily the best deal for a mid-range phone in the country. It looks like there are no issues with ordering at the moment - multiple Android Police writers have been able to place the phone in their shopping carts. 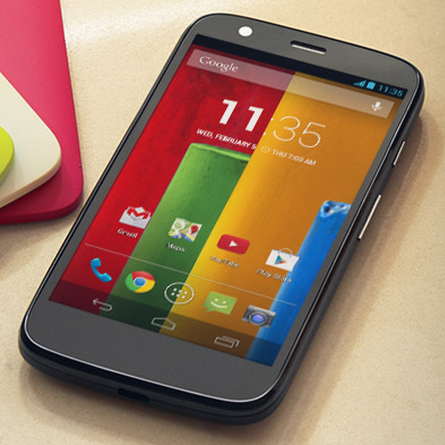 The Moto G is the slightly down-market version of the Moto X. It's a little bigger and a considerably less powerful, but it's still very compelling for its market position. The smaller 4.5" screen matches the Moto X at 720p, but the processor and RAM are notably downgraded at a Snapdragon 400 and 1GB. The rear camera is a mere 5MP. The US manufacturing and customization have had to go on the chopping block, but budget-minded consumers can swap out the plastic back plates for a fresh look, and the phone includes an FM radio tuner (which hasn't been seen on high-end phones as of late). The Moto G does not have the Touchless Control or Active Notification features from the X and newer DROIDs. It looks like the GSM model does not include an LTE radio, at least according to Motorola's specification page. Please note that this version is only compatible with GSM networks - CDMA providers like Verizon (which has already confirmed that it will sell the phone) will need separate hardware. 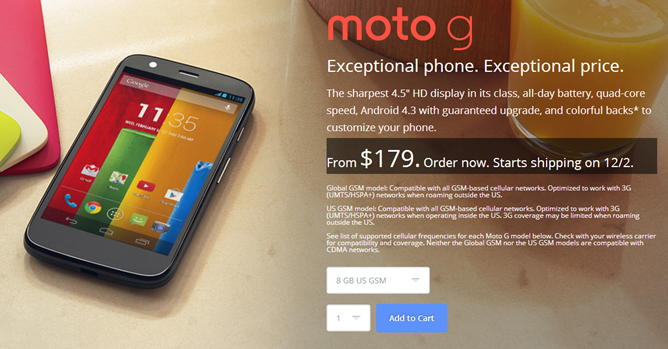 The Moto G will have Android 4.3 when it arrives to early buyers, and a quick update to Android 4.4 is already scheduled for early 2014.